At Tuesday’s Northampton Board of Supervisors meeting, VDOT’s Chris Isdell outlined the 6 year rolling plan for road improvements in the county, part of which includes the current Route 642 improvements, which according to Isdell, are underway. Left from the narrative is the fact the 1991 Annexation Order – Law No. 27, which allowed the Town of Cape Charles to usurp farmland to allow for the construction of private golf community, required that the developer Brown and Root build a wastewater treatment plant, and to Isdell’s comment, construct the “connector road” from old Stone Road to the entrance of the PUD. The beauty of Faulkner’s Yoknapatawpha County, is that, even as present events attempted to assume dominance, the past would never let them. As French film maker Jean Luc Goddard noted, reading Faulkner is like driving down the highway in reverse, using the rear-view mirror to navigate. What we are seeing in Cape Charles and Northampton County is the same. While people move here and try and change everything, try and eliminate the past and posit some new and improved version of the town, the crimes that form the foundation of the new Cape Charles continue to claw their way to the surface. 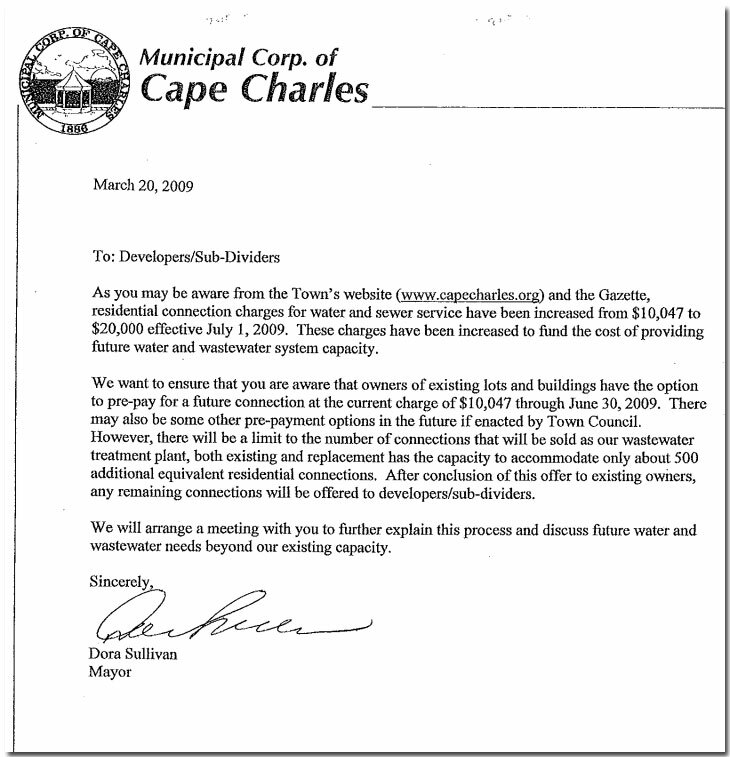 Despite being fully aware of the obligations the developer had to the Town of Cape Charles, as far as we could find, the Town never sued anybody over the annexation order (we asked an independent person to verify, and they could find no record of Cape Charles suing over the water and wastewater treatment plants, the connector road–neither Dicky nor Bay Creek). They may have looked into it, but at the time, there may have been little or no Foster or Bay Creek assets to go after – all were obligated to banks and other entities. For some time now, the term ‘expansion’ has been used to muddy the ‘intent’ of the Annexation Agreement Order Terms and Conditions, noting that ‘the build out’, per se never occurred (this of course was a shell game–shutting down Marina Village East and the commercial activities at the Marina Village, all the while developing the Fairways condos). 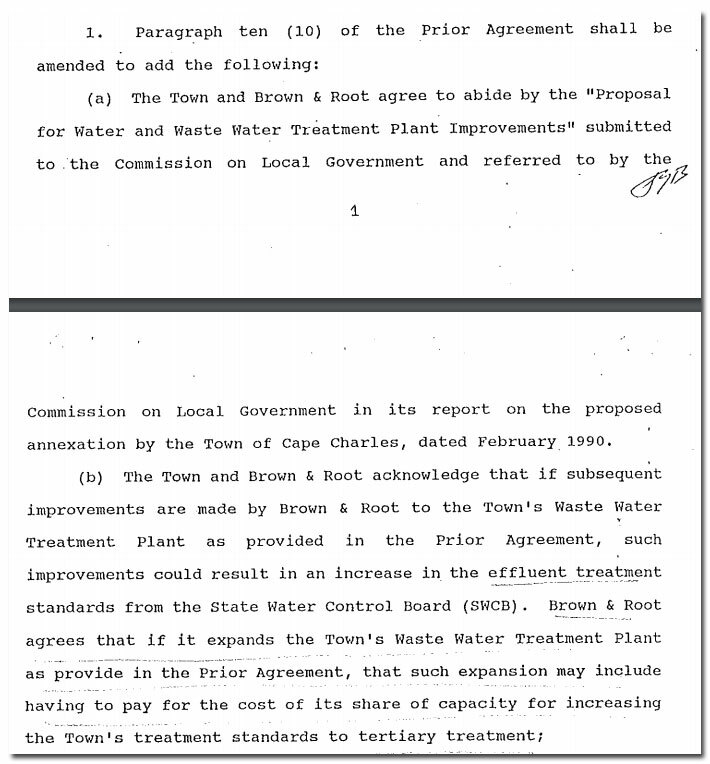 However, page 65 of the Terms and Conditions to the Annexation Order by the Special Annexation Court specifically states that the purpose here is also to protect the Town, that the firm (Brown & Root) should ‘commit’ to helping Cape Charles upgrade the wastewater plant, and that this should include all costs, ‘including tertiary improvements’. The Annexation Court noted that the DEQ would soon be forcing the Town to meet stricter effluent standards–these upgrades would benefit the developer. Besides, what would they have to hook up to? Note: The Town did pay to the engineers the full cost of designing a 500,000 gal/per day Plant. It is also important to note that the Marina Villages complex with Kings Creek Marina and the Oyster Farm are subject to the PUD, though not subject to the Bay Creek POA Declaration and Covenants of the lot and home owners. What this means is that the new owners of the Oyster Farm get to use and potentially demand future water and sewer treatment services without having to fund any additional infrastructure costs. Except for inflated connection charges. Brown & Root, Foster and Sinclair are on the hook for the infrastructure and required upgrades. Why is this important? The obligations handed down by the Annexation Order – Law No. 27 are not contractual, not gentleman’s agreements, but are law. Mainly, annexations are handled by a body called an Annexation Court, and although they are judicial in nature, the finalized agreement becomes a ‘legislative act’ of the Legislature of Virginia. All terms and conditions are valid, and they never expire, except by legislative acts. The agreement runs with the land. While the following passages are fairly dry, they are nonetheless extremely important, and highlight just why Annexation Order – Law No. 27 was written the way it was. The Virginia Constitution of 1902 provides an absolute separation of cities and counties, towns and municipalities by providing for a distinctive ‘Top Down’ governmental organization. In line with the Saltville doctrine it draws a clear distinction between cities and towns, and provides that future extensions (annexations) and contractions of corporate boundaries shall be accomplished by general legislation. Of additional importance is the fact that the Constitution of 1902 falls short of assigning towns a clear position in top down governmental structure. Importantly, on March, 1904, the General Assembly passed an act, (Code of 1904, title 16, chapter 44, section io4a) which stated that annexation by municipalities becomes a judicial function. While the actual proceedings are still basically judicial in character, the current statute as well as past statutes are at the same time legislative in character. At the core, the Legislature began to take into account the financial burdens often imposed upon all parties in annexation proceedings, as found in section 15.1-1041sub-paragraph (b), “The court shall determine the necessity for and expediency of annexation, considering the best interest of the county and the city or town, the best interests, services to be rendered and needs of the area proposed to be annexed, and the best interests of the remaining portion of the county …” With focused attention on the cost factor; and therefore, a great deal of significance and importance is attached to the “terms and conditions” of annexation. That is, the financial ability of the city or town to serve the area “after annexation” appears to be the Commonwealth’s approach to annexation. 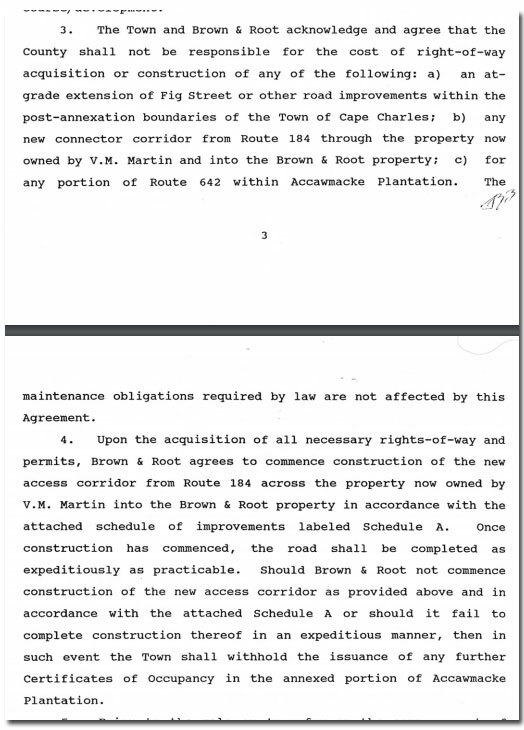 Early arguments by Northampton County against annexation went along these lines, that Cape Charles could not meet its obligations, which is precisely why the Annexation Court crafted the terms and conditions as they did. That is, it was expected that the developer would play a significant financial part in the process. Given the uniqueness of this annexation, that was to be expected. Most annexations involve a city and a county, say Portsmouth wanting to annex portions of Norfolk County in order to meet its growing urbanization needs. In this case, the town was not growing, but a developer had purchased a big chunk of land initially designated for oil work off the coast (leveraging the new harbor that had been built out during the CBBT construction). With those plans laid bare, Brown and Root now needed to dump it on somebody. In order to fulfill its ‘vision’ for Accawmacke Plantation, including 34 subdivisions, it would need to have the Town annex the adjacent farmland. When the Annexation Court approved the annexation, the terms and conditions became an act of the legislature of Virginia; its obligations must be met, and they do not expire. Certainly, Mr. Foster understood the obligations when he bought the property; however, whether Sinclair knew it was also taking on the obligation from Foster is another matter. Either way, the obligations set forth the by Annexation Court now belong to Sinclair Broadcast Group. The Town was also aware of these obligations, which must have led then town manager Joe Vaccaro to send a letter to Steve Bennett at Bay Creek, asking for payment of $21.1 and $8.9 million. 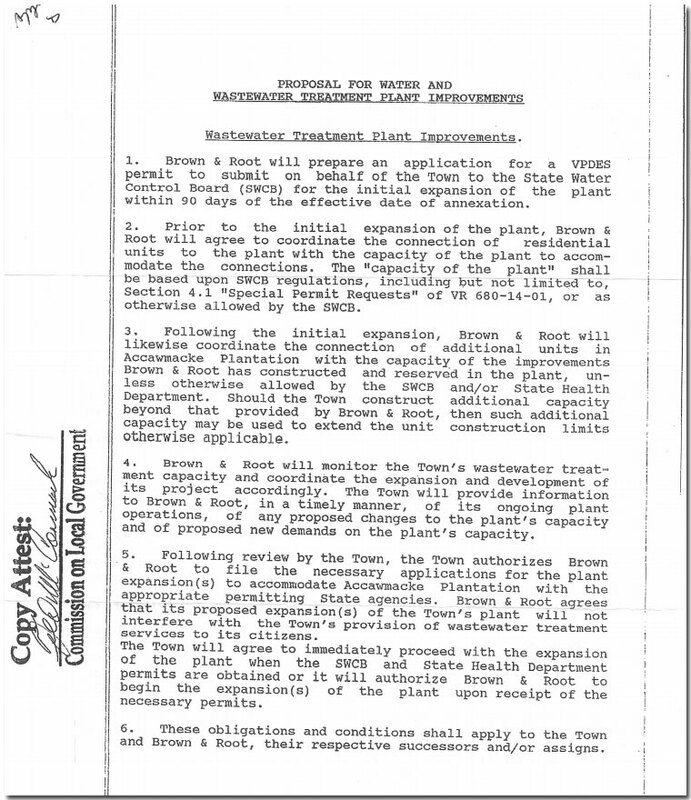 Then Mayor Dora Sullivan, who also contacted Mr. Foster via post, also understood Bay Creek’s obligation to pay the cost of the new wastewater plant. Why the town would buy into Mr. Foster’s ‘expansion’ argument is still a mystery; however, those persistent questions on the part of town manager Vaccaro may have eventually led to his ‘resignation’. While Panek and Sullivan, and the Town Council have touted the creative financing used for the new plant, a large part of the construction was financed through a federal grant and state interest free loan (which is why your bills are now so high). 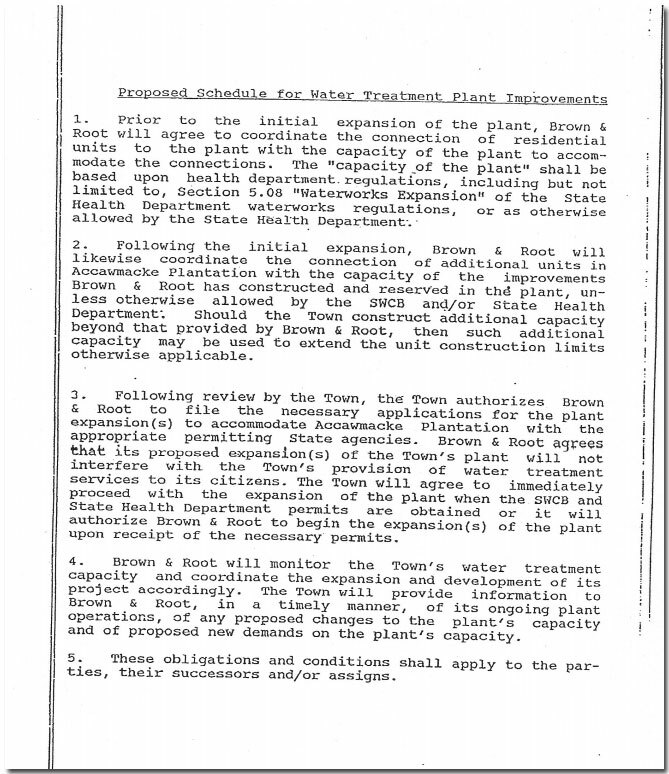 However, the federal grant was from stimulus funds, perhaps from the Environmental Protection Agency, and the question is, did the Town disclose that the obligation to upgrade and expand the plant was in dispute with Mr. Foster and Bay Creek? This may be critical, as failure to disclose could open up the question as to inadequate disclosure requirements, and severe federal penalties. The same holds for expanding the right of way; the developer is obligated to pay for all of it, not the state, county or town. 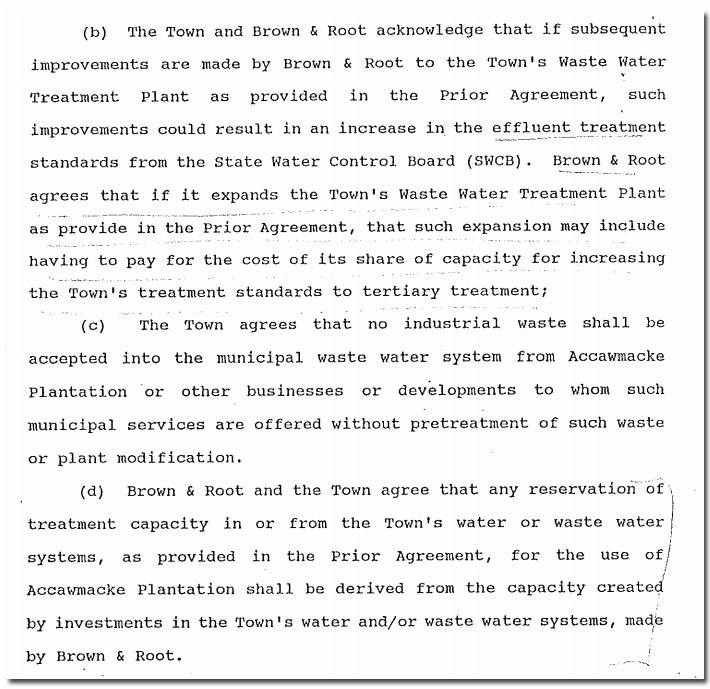 Page 65 of the Report on the Local Commission identified this and in the Terms and Conditions of the Annexation Agreement required this commitment by Brown&Root. The Special Annexation Court duly noted this in the Order Law No. 27. It also noted that no costs for the road connector are to be borne by Bay Creek subsequent property owners, meaning no federal, state, county or town taxes would be used and therefore paid by Bay Creek lot owners. While the County Administrator may be taking the lead on land acquisitions, not informing the State that someone else is obligated to pay for the road work, again begs the question of who knew what and when? As a note, Ms. Nunez and the county must be aware of all this, as current County Attorney Bruce Jones was the County Attorney when the annexation agreement was finalized–he should be somewhat aware of who is obligated to do what in regards to improving Route 642. 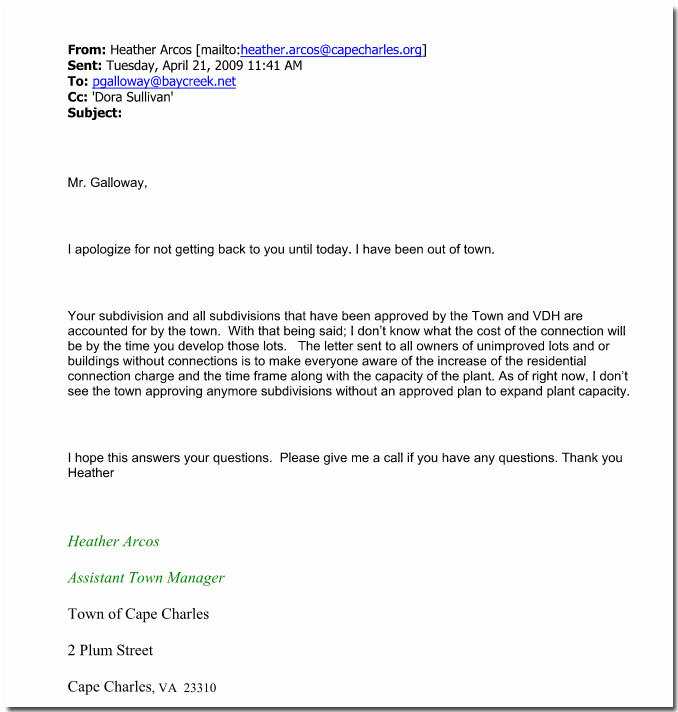 Why Cape Charles, and now the County choose to bury their heads in the sand, and not enforce the obligations in the agreement, is some question citizens should be eager to find out. 1. The Town by Agreement had to ‘reserve’ capacity for Bay Creek. 4. The Town moves not to approve any more subdivisions without an expanded plant. 6. As far as 642, no costs for the road connector should be passed on to Bay Creek subsequent property owners (no federal, state, county or town taxes would be used and therefore paid by Bay Creek lot owners). The Town of Cape Charles and the Northampton County Board of Supervisors and staff, seem to think that the statute of limitations has run out. But they’re wrong—there is no statute of limitations for Order Law No. 27. It is forever. The question is, where is the prosecution? Where is the state police? Where are our state senators and delegates, even our Eastern Shore’s own Governor? The law has been broken and no one seems to care. Excellent article Wayne! It’s pretty pathetic that no one seems to care. The town of Cape Charles is always up to something shady aren’t they? You have done so much work making this easy to understand. MAYBE EVEN KAREN JOLLY DAVIS can understand it now. I care and as a resident of Cape Charles I think it is time for someone to be held accountable for their actions. The facts are clear and laws have been broken. Why have the folks that made these decisions been given a pass? Citizens are held to standards, why are our government officials not held to the same moral and law abiding standards? It may be painful but it is time to put an end to this debacle and move on. This argument is old and needs to end. Do what is right. Political Correctness, mixed with ‘you can’t say that’. It starts in public school. Please keep this issue in the forefront, Wayne. I am not a CC resident, but as a county taxpayer, this makes me really angry. If I lived in town, I’d be doubly ticked off!! Why isn’t any law enforcement agency pursuing this?? Pathetic. I guess it’s easier to rip off the little guys than go after the big, well-connected ones these days.